These mid-century Barbini treasures, while similarly shaped and sized as Barbini's apple & pear bookends, are even more spectacular. And nearly impossible to find. This sublime collection of 5 Alfredo Barbini fruits, unlike the bookends, are hollow, much finer and more delicate. And meant to grace your largest and most beautiful Murano fruit bowl. Each of these magnificent pieces are done in a thin delicate layer of translucent lavender glass, then layered with a crystal sheet strewn with tiny flecks of gold. The effect is breathtaking. The pear is about 6" tall and 4" wide, and the rest of the fruits can be extrapolated from there. The pear, apple and banana are immediately recognizable, but the two crackle glass pieces (both different sizes and shapes) are probably meant to emulate the textured skin of citrus fruits and may be an orange and a lemon or lime. 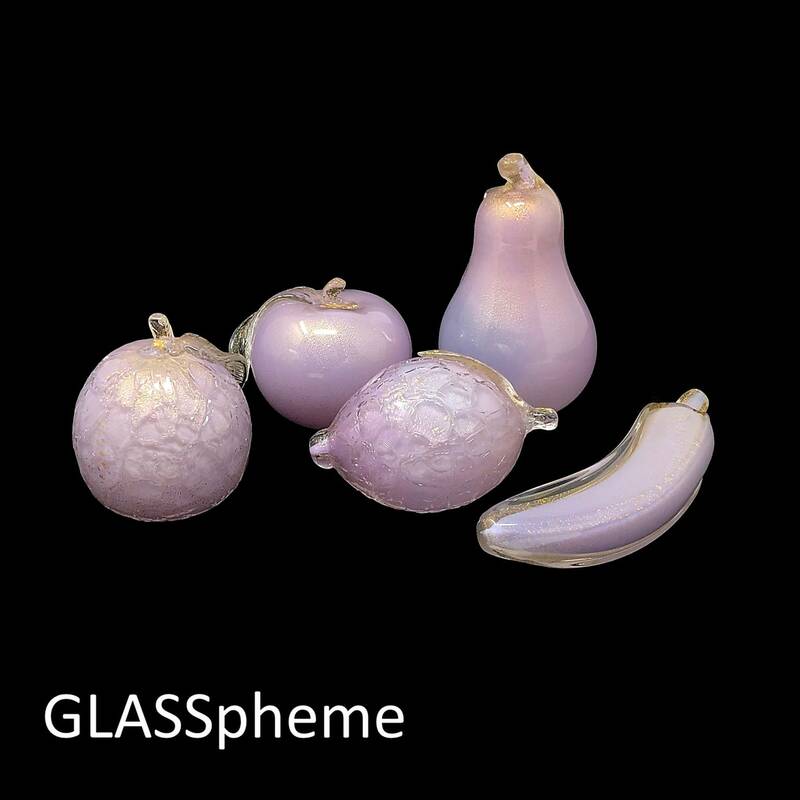 Our lavender Barbini Murano glass fruit collection is in absolutely mint condition, with no breaks or chips or any damage at all. I've been 'nipped' handling the crackle glass pieces--the edges of the crackle can be sharp. But upon the closest examination, this is how they were produced--no unintended cracks or chips here.